We love baking! Our prep. for Valentines Day and basically any special day, involves making shortbread. I use an old recipe from home that everyone raves about. It is very complicated… it only has four ingredients! Cream butter and sugar until soft. Beat in sieved flour and cornstarch. Kneed well and cut into fingers or shapes. Bake at 350 F for 20 minutes depending on thickness. 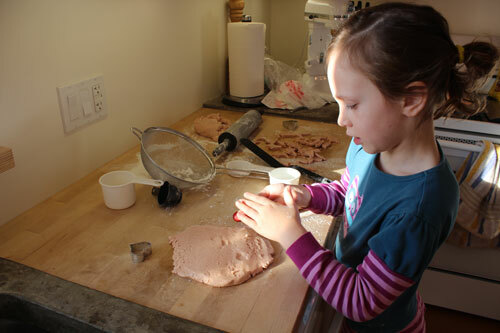 What better sensory play than fresh shortbread dough? Although quite a bit gets eaten before it makes it to the oven! We did add a wee bit of red food colouring for Valentines day. Pretty hearts all in a row.